"Desperate Hours," written by legendary scribe David Mack, was the first "Star Trek" novel to adapt the new "Discovery" series. 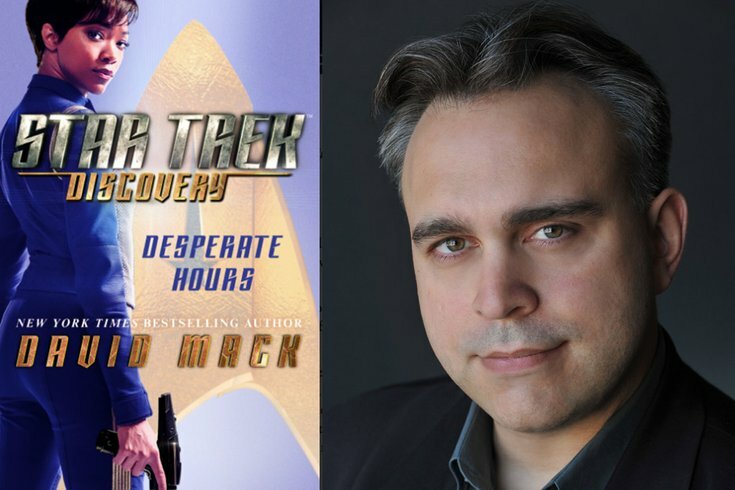 As the "Desperate Hours," the first "Star Trek" novel to adapt the new "Discovery" series, continues to rack up sales and critical acclaim, author David Mack sat down with PhillyVoice for an exclusive interview. PV: First, great job! I found the story extremely compelling! DM: Thanks! Kind of you to say. PV: You have written about virtually every character and incarnation of "Star Trek" at this point. In almost all cases, they were characters fans were familiar with. You simply had to interpret them. But the characters in "Discovery" are brand new. Some fans like myself haven't even watched the show yet. So how was doing the first book featuring the "Discovery" crew challenging, different and exciting for you? DM: It was my first time writing a tie-in novel for a series I had never seen, which posed special challenges. I was used to having heard characters' voices and observed their physical presence. This time I had only the first few scripts, some concept art and some set photography to guide my depiction of them on the page. I also had to revise the manuscript and story outline as I went along in order to keep my work consistent with the show as it evolved over the course of several months while it was being written and filmed. PV: You obviously started "Desperate Hours" long before the series hit the air. What did you do to prepare? Were you given a series bible? How many episodes, if any, did you watch to get a feel for the characters? DM: As it happens, there was no series bible. This was a break from past "Star Trek" series, which had used such bibles as a touchstone for writers of episodes and tie-ins. There also were no episodes or filmed content available for me to watch before the book was locked and delivered to the printer. Consequently, my interpretation of the characters' voices was extrapolated from the scripts alone. Fortunately, because I have training as both a novelist and a scriptwriter, I was able to suss out the dialogue patterns and character subtext present in the scripts. My greatest asset, however, was "Star Trek: Discovery" staff writer (and fellow "Star Trek" novelist) Kirsten Beyer, who also serves as the show's media tie-in coordinator. Kirsten and I have been close friends for several years, and she was able to guide my efforts with sage advice and behind-the-scenes information. I also received excellent input and help from CBS Television Consumer Products licensing executive John Van Citters. PV: You had the newest crew and the oldest crew together. Was that a conscious decision? Why did you go that route? DM: The pairing of the crew of the Shenzhou with the crew of the Enterprise under Captain Pike was the result of a request made by series co-creator Bryan Fuller. Early in the development process of the first novel we had a few false starts, mostly due to changing assumptions and shifting story priorities in the writers' room. After two story ideas for my book had to be jettisoned, Bryan suggested a prequel story that would put those two ships together. Though his request did not explicitly ask me to pair Burnham and Spock, I intuited that to be the motive for this pairing. The fact that we ended up crafting a team-up between the franchise's first filmed characters and its newest characters was not one that I had thought about at the time, but now that you've described it in that manner, it does seem to possess a certain poetry, a narrative symbolism that speaks to the sense of carrying on a venerable legacy. 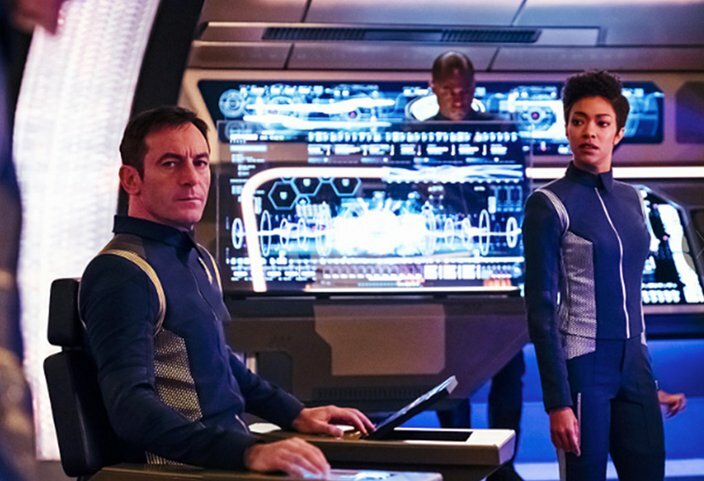 “Star Trek: Discovery,” which streams on CBS All Access, features new characters Captain Gabriel Lorca (played by Jason Isaacs) and Michael Burnham (played by Sonequa Martin-Green). PV: One of the most interesting things is the similarities between a younger Spock and Lt. Michael Burnham. You have them play off each other constantly. This gives Burnham instant gravitas, since Spock is arguably the most popular and important "Trek" character. Was it your intention to flesh that out and how do you see the Spock/Burnham dynamic? DM: It was a deliberate choice to make Spock and Burnham interact, and by so doing reveal and contrast elements of their respective characters. To be frank, that was the underlying impetus for writing this novel. As for the nature of their relationship, I built upon what I knew was being established by the series' writers. They are foster siblings, but because Burnham is several years older than Spock they had little direct interaction during their youth. What they have in common is the experience of feeling as if they have disappointed their shared father, Sarek. However, each of them feels as if they have let Sarek down in different ways, and each sees the other as the example against which they were measured and found wanting. Consequently, there is an undercurrent of resentment lingering between Spock and Burnham when they first interact here as adults. This of course echoes the overall dynamic of the relationship in "Star Trek: Discovery" between Burnham and Saru, who have a long professional rivalry that sometimes feels like a sibling conflict rooted in their desire to secure the mentorship, favor, and attention of their commanding officers. Aboard the Shenzhou, Burnham and Saru both want to be the mentee of Captain Philippa Georgiou; when they subsequently find themselves together again on the Discovery, they repeat that dynamic with regard to Captain Gabriel Lorca, but with their positions reversed. The theme of family is a powerful ingredient in the narrative formula of "Star Trek: Discovery." PV: One thing I note is that Pike's Spock has not yet achieved the iconic status of Kirk's Spock. Was that relative greenness a reason you decided to go with Pike and not Kirk? DM: Well, there were other factors driving that decision. First, I was asked to pair the crews of the Shenzhou and the Enterprise in the pre-2256 time period. In order to make my book track with established continuity, the Enterprise needs to be under the command of Captain Pike during that time. Circa 2255, James T. Kirk is a lieutenant assigned to a planetary survey on Neural. "Desperate Hours" takes place a decade or so before Kirk assumes command of the Enterprise. With my time frame dictated by the setting established in the two-part series pilot of "Star Trek: Discovery," I researched what had been established about Spock in that era. My story is set after his depiction as a shouting, too-tightly-wound junior officer in the original "Star Trek" pilot, "The Cage." Because he underwent a major shift in personality before we saw him again "Star Trek: The Original Series," in which he is a calmer, more centered person, I chose to connect his experiences in "Desperate Hours" to this on-screen maturation of his character. PV: How did you come up with the BIG physical threat of the Juggernaut? DM: I needed a threat serious enough to merit involving two Federation starships in one plot. Also, for some time I've wanted to open a "Star Trek" story by having something rise up out of an ocean and demolish a massive drilling platform. I guess we can blame that on my enjoyment of the film "Pacific Rim." PV: Was one of the benefits of using Captain Pike that he is more of a blank slate and the readers would more easily buy him following orders even if it meant the deaths of crewmen and the population of an entire planet than Kirk? No, Pike's presence was dictated by the time period and the request for the story's premise. My decision to portray him as a harder-edged soldier was based on Jeffrey Hunter's performance in "The Cage." There is a lot of fire in Pike's temper in that episode. He is a man torn between his self-image as a scientist and explorer, and his duty to act as a soldier and a leader in times of peril. I also needed a stark contrast between his command style as a young by-the-book type and Georgiou as a more experienced, thoughtful and diplomatically minded starship commander. They were almost analogues for Kirk and Picard, in that respect. PV: What to you is the "nut" of "Desperate Hours"? DM: It's about letting go of misconceptions and having the courage to become the best versions of ourselves. PV: What are some of your favorite moments in the book? DM: Far and away my favorite sequence, the one that serves as the heart of the story, is the mind-meld sequence between Burnham and Spock. I had each character relive moments of tragedy, loss and suffering from the other's life, so that the two of them develop a sincere empathy for each other. A close second, for me, would be the moment in the finale, after the two starship crews have pulled together to save the day, and the bridge officers of the Shenzhou permit themselves a moment of celebration — and Captain Georgiou, though she remains apart from the revels as a matter of command dignity, takes pride in the camaraderie of her team. PV: What to you is the appeal of these characters versus the many others in the "Trek" universe? DM: What I like about the principal characters of "Star Trek: Discovery" is that when we meet them, most of them are in some way flawed and incomplete. Except for perhaps Captain Georgiou, none of them has yet achieved his or her full potential. Some, like our main character Michael Burnham, are paying penance for a grave choice made in good conscience but to disastrous result. Because of this, our characters have a lot of room to learn, to grow, to change, and to discover both the best and the worst that they can be, and then choose their paths. This gives them tremendous dramatic potential, and for those of them who do achieve greatness, it will be the product of hard work and sacrifice, which will make for a compelling journey to witness over the run of the series. PV: Anything you'd like to say that I forgot to ask? DM: You could ask me what I have coming up next. My next book scheduled for publication is my "Star Trek Titan" novel, "Fortune of War," a follow-up to a third-season episode of "Star Trek: The Next Generation." That novel comes out on November 28 and will be available in paperback, eBook, and unabridged digital audio. January 2018 will see the debut of my new original contemporary fantasy series "Dark Arts." The first novel, a World War II epic titled "The Midnight Front," has been described by Kirkus Reviews as "Equal parts brimstone and gunpowder … [a] complex and entertaining fantasy." I hope that readers who have enjoyed my work for "Star Trek" and other series over the years will come with me as I embark on this new narrative journey of my own.